Hello! 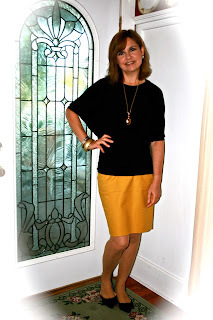 For this week's Fashion Over Fifty post I am wearing the 41 Hawthorn Shirt from StitchFix that I told you about in a prior post HERE. I can't tell you how much I LOVE this blouse. The knit material hugs my body in all the right places giving me the illusion of an actual waistline (I'm naturally thicker in the middle, like most middle aged women) yet doesn't reveal any bumps or bulges like most knit clothing does. I wore my blouse with a mustard skirt that I picked up at T.J. Maxx, simple black pumps, and gold jewelry. 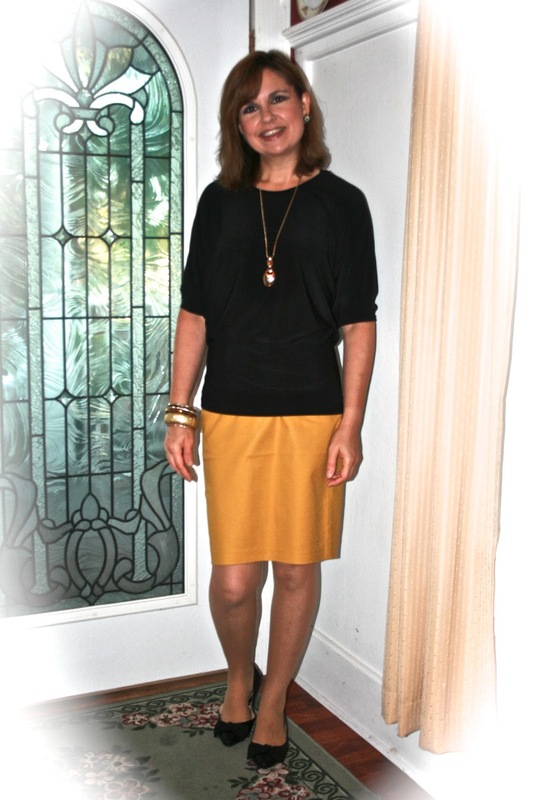 The blouse has a really nice exposed gold back zipper that adds a lot of interest to an otherwise plain top. 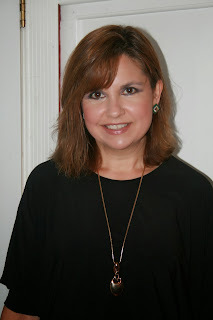 I wore the geometric emerald earrings by Adia Kibur that I got in the same fix (click the link above for a close up), a simple gold pendant necklace, and some sparkly gold bangles. In this last picture I placed my hand on my hip so you could see the interesting shape of this blouse. As everyone knows, middle aged women gradually start to gain weight in their midsection due to hormonal changes. Other than diet and exercise, we can also look for clothing that helps minimize the appearance of the waistline, like this 41 Hawthorn blouse. I know a lot of women like to wear shape flex or body contouring undergarments to help with this issue, and I do too on occasion, but I only like to use those undergarments when absolutely necessary because I find them all so uncomfortable and cumbersome, no matter what the brand. I prefer to just find clothing like in today's post, to do the work for me! I am linking this post to Friday's Fab Favorites! Very cute outfit! Nice top to hide that extra! That's a gorgeous blouse and I'm sure you'll be pairing it up in so many different ways this fall. Love the zipper detail! Love this combination and I could see me wearing that top. You look great in it! Love the colour of the skirt!